Grenzer Games just launched their Kickstarter campaign for Sector Commander: WWII, their new strategic board game. 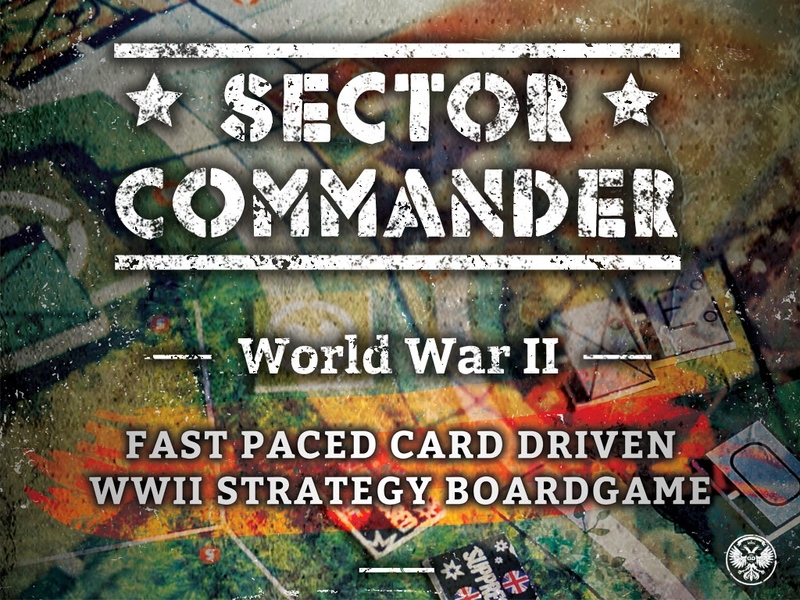 Sector Commander: WWII combines elements of card games, board games and war games all in one package that is quick to learn and challenging to master. 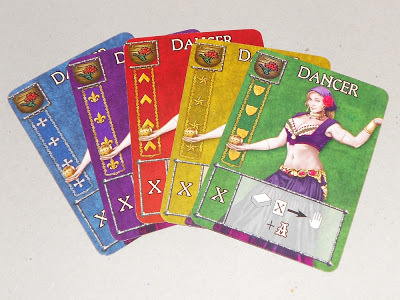 Using decks of unique Combat Cards to supplement your actions and randomly chosen objective points no two games are alike, with hundreds of variations of board layout, deck composition, objectives and forces. Over a year in play testing and two years of development, we have reached the point where it’s ready for the wider world to play. If our play testers are any gauge we think you will really love Sector Commander, so we just need your help to get it produced in its full glory. 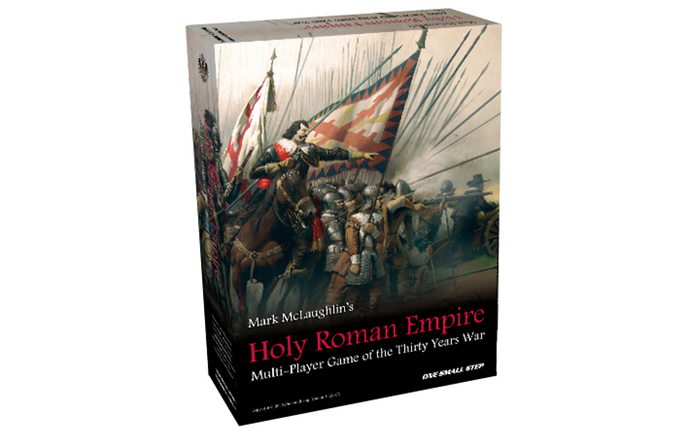 One Small Step Games is running a Kickstarter campaign for Holy Roman Empire. Players are charge of one of the countries involved in the 30yrs War. Through political maneuvering as well as battlefield might, they each are looking to come out on top of one of Europe’s longest conflicts. The year is 1619. Matthias, emperor of Germany, has gone to his grave. A year-old rebellion in the imperial province of Bohemia had divided the empire along religious and political lines. Bohemian rebels have elected a minor German prince, Frederick, elector Palatine, as their king. Protestant princelings rally to Frederick, elevating his status to that of a rival to Em­peror Ferdinand II, Archduke of Austria, for the imperial throne. As mercenary armies are raised against Ferdinand, the Catholic King of Spain and Duke of Bavaria rally to his side. France and Sweden turn their attention to Germany in eager anticipation of the dismemberment of their great rival, the Holy Roman Empire. 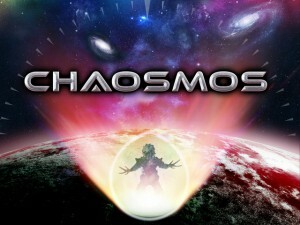 Mirror Box Games has launched their Kickstarter campaign for Chaosmos, their new board game. 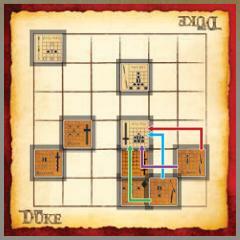 New from Catalyst Game Labs is The Duke, a Chess-like abstract with a few interesting features. There are more than a dozen types of pieces in the base game, each with its own movement and capture rules. And to top it off, only a few pieces start on the board. One of a player’s options each turn is to draw a random piece from a bag and enter it into the game. One of the simplest implementation of Hand Management is found in traditional card games which, as a result, are very accessible and popular. Players are dealt a hand of cards at the start of each round and then play one or more cards in turn order until the hands are depleted. The cards only interact with the other cards played that turn and generally have a single use such as relative power when determining who wins a trick. Concepts like trump are a good example of how the utility of a card may change from round to round. Along those lines, card counting is a good example of how being aware of the game state (what has been played) will alter the relative usefulness of a card.. 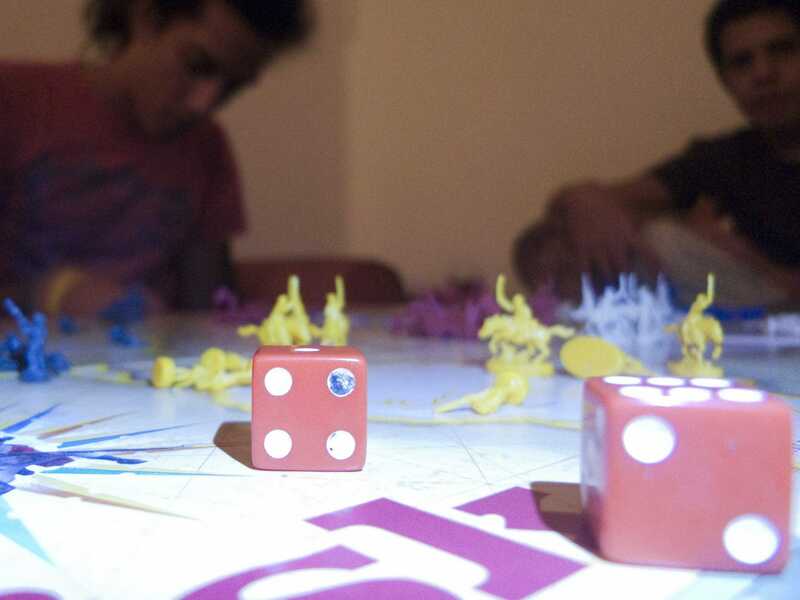 When it comes to board games, Risk might be one of the most cutthroat ways to spend an evening among friends. Sure, Monopoly involves quite a bit of capitalist-oriented skulduggery, but Risk involves actually attacking your fellow players. With armies. To take their stuff. Like Monopoly, Risk involves both skill and luck. 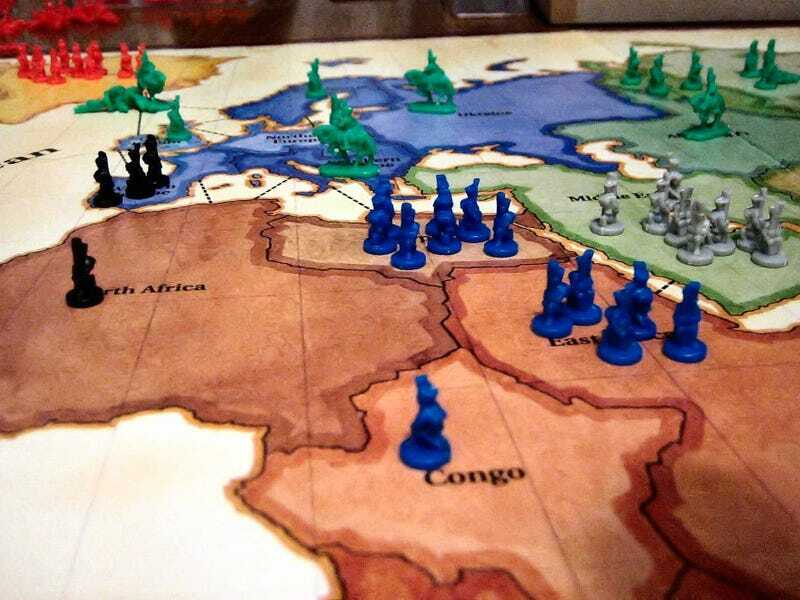 The objective of Risk is to take over the world by eliminating all of your enemies. 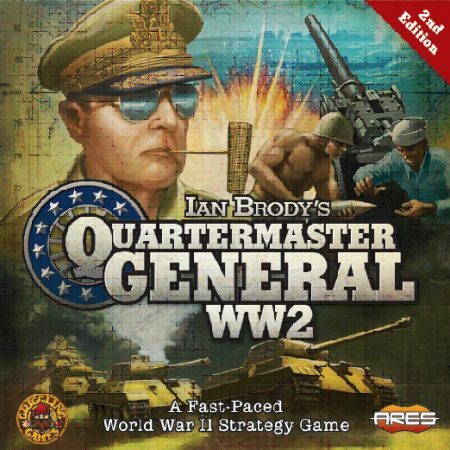 You amass territory by attacking your adversaries’ armies. When you attack enemies, you roll dice. Since attacking and defending with dice define every interaction on the Risk board, knowing the ways to use the statistics of battle to your advantage give you a distinct advantage when playing. Here, we look at Risk as mathematically as possible, drawing from some excellent scholarship on the subject. By far the most important thing to understand is the map. Controlling the continents gives you an added bonus depending on the size of the continent. Garrett Robinson, who graduated MIT in 2009, wrote a paper outlining the math behind Risk. That’s somewhat misleading though. The size of the territories can be misleading, making it seem like certain areas are more difficult to hold than others. Plus, you can’t really get a sense of how truly vulnerable some individual territories are. So we know a few stats about the board right off the bat. Here are the number of bonus armies you get for every turn you hold each continent. This also gives us a look at which continents have the highest return on holding territories. This list shows you territories divided by armies. As you’ll see, Europe gives you the highest return on holding the continent, as for every 1.4 territories you hold, you get an army. Australia is the least lucrative, as it takes holding 2 territories to win each army. It’s not just about ensuring that you get the maximum value per territory, it’s also about minimizing the probability that your opponents can take one territory and strip you of your continent bonus. 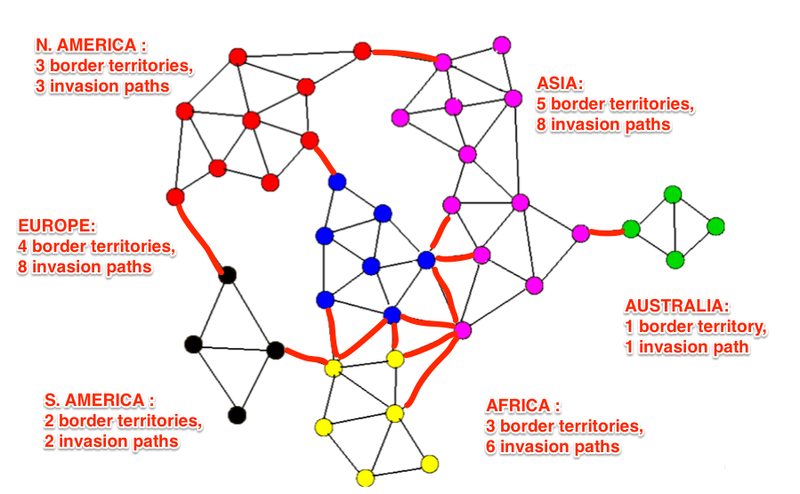 This is to say that continents with only one or two sources of invasion are easier to defend than continents with five or six routes of invasion. 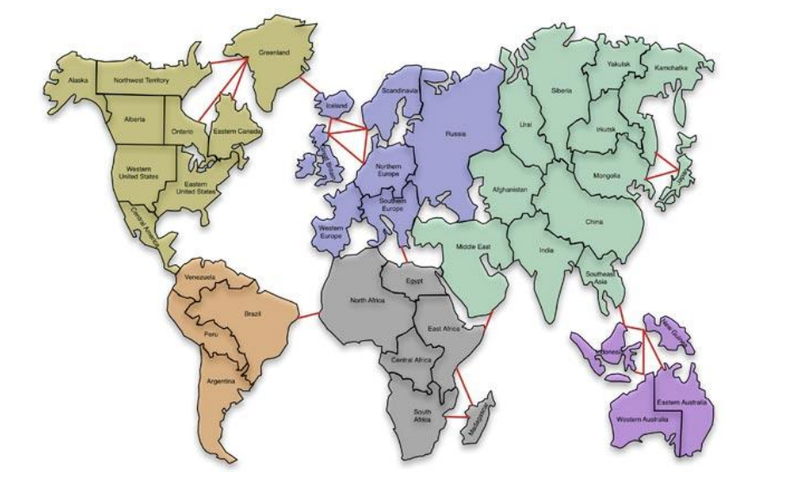 So let’s look at how many ways there are to invade each continent, and how many territories lie on borders. If you’re looking to defend on home turf, you’ve got to fortify every border territory that can serve as a means of invasion. So we can see that Australia is obviously the easiest to defend, with 2 bonus armies allocated each turn to aid in the defense of the continent on the border. But of the countries that give out the biggest rewards, North America is the easiest to hold, and holds the largest bonus per border. Surprisingly, Europe is actually more difficult to hold than Asia when you look at how many border territories need to be defended for each bonus army awarded by holding it. Africa and South America only provide one bonus army for each border territory that requires a defense. But enough of preparing for battle. Now let’s dive into the stats and find out when you should fight. Battles occur in rounds, with an attacking player typically rolling (up to) 3 dice, and a defending player (up to) 2 dice. After rolling, dice are paired up (Highest rolled attacker die against highest rolled defender die, then next highest rolled pair if required). The highest rolled number wins (eliminating one opponent army), with ties resulting in a win by the defender. Attacks by more than three armies are played in a series of rounds. 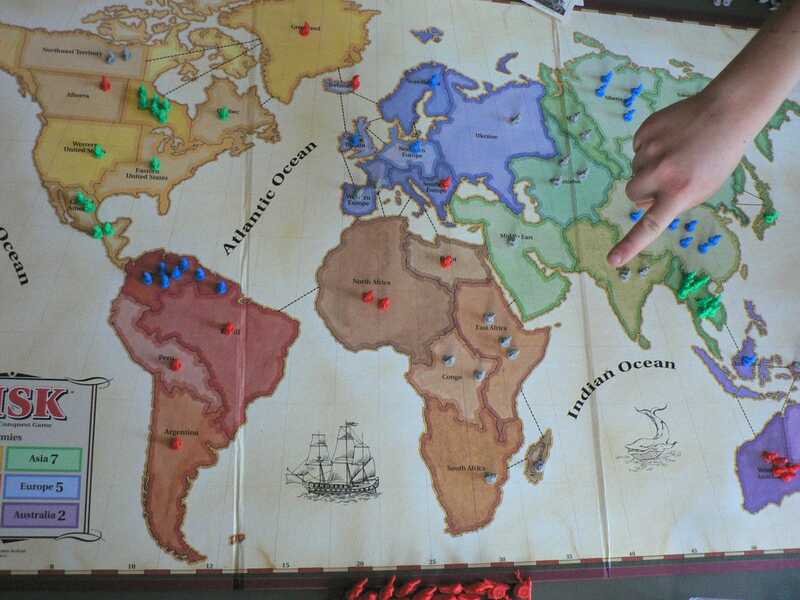 After each round, armies from the losing team are removed from the board and the remaining pieces continue to duel. So our main question is who has the advantage here. Generally speaking, whoever rolls more dice does better. When the dice are evenly matched, the defender tends to win out. But what does this mean for long, protracted campaigns? 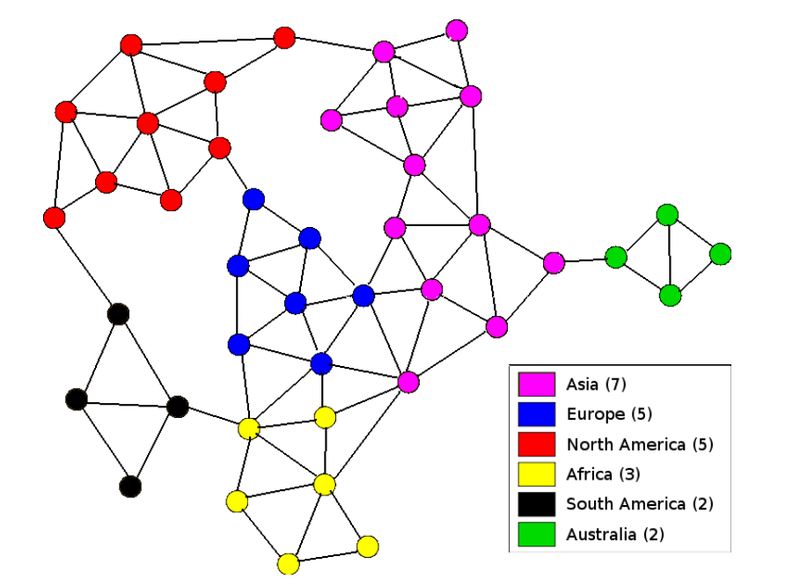 First published in Mathematics Magazine, Jason Osborne of North Carolina State University tackled this problem with Markov chains in an outstanding 2003 paper. So what can we see from this? In large battles, the attacker has the advantage, even when they’re slightly outnumbered. This is because of the extra dice the attacker has to roll. 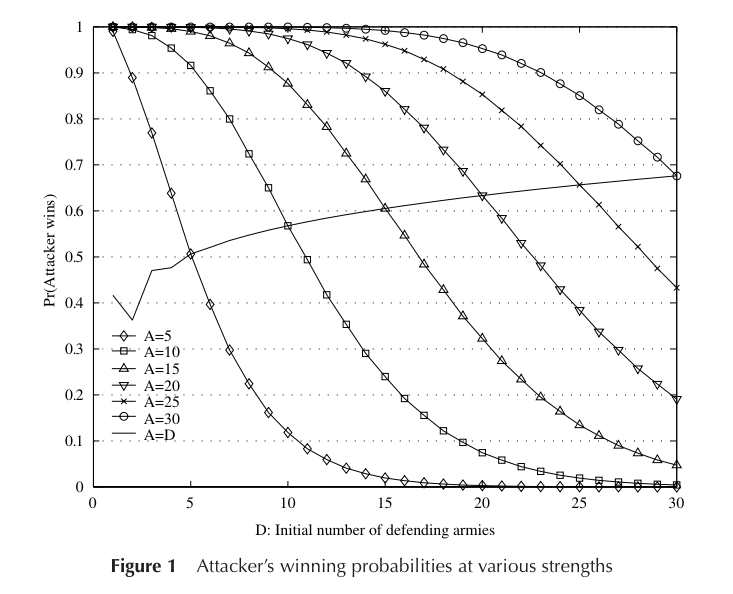 The larger the battle, the larger the attacker advantage. So if you have a border destined for dispute: attack, attack, attack. Here are the five things to take away from this. Holding the continent of Europe requires you to hold the fewest number of territories per bonus army. However, almost 60% of European territories lie on a border. The per-territory reward comes with risk. That risk can be measured by the ratio of continental bonus armies per border territory. North America has the most favorable ratio. Africa is easy to invade but difficult to hold. The amount you need to commit to its defense make it a particularly unsafe Australia. When you know battle is inevitable, attack as soon as you have the same number of attacking armies as your opponent has defending armies. You hold the advantage. And of course, never attempt a land war in Asia. That’s just basic. 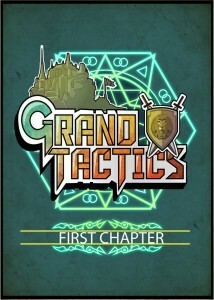 Grand Tactics: First Chapter of the Matilda Era and the Rise of Novice. A Strategy Board Game, Battling for the title of Matilda Defenders is looking for funding on Kickstarter.